Trip Sitting: a guided journey along the timeline of psychedelia from inception to the present day. From the origins and applications of the term “psychedelia”, explore how this descriptor manifests in today’s multiple media landscapes as we ask: Is it still trippy if everyone’s tripping? A native of Boulder, Colorado Janet Feder (www.janetfeder.com) is most widely known for pioneering composition for prepared guitar. She has been featured on numerous recordings, radio programs, and film scores including the internationally acclaimed solo albums Songs With Words (2012), T H I S C L O S E (2015) and compilations The $100 Guitar Project (Bridge, 2013), I Never Meta Guitar (Clean Feed, 2010)and 156 Strings (Cuneiform, 2002). Free from genre, her music both acknowledges and is simultaneously unmoored from the trappings of jazz, classical, avant-garde, folk or pop, creating a new musical lexicon and aesthetic ideal alike. Janet is a lecturer at the University of Colorado. 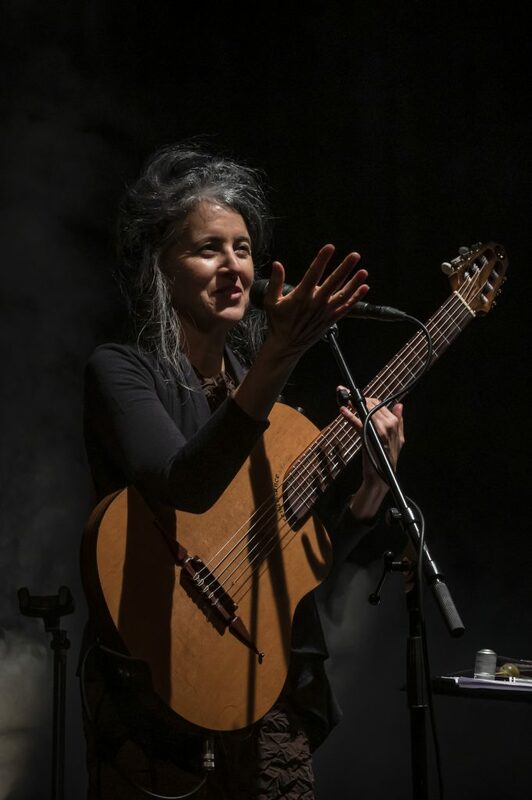 Touring and teaching internationally, she has performed and collaborated with a diverse landscape of renowned musicians including Paolo Angeli, Nels Cline, Amy Denio, Erik Deutsch, Bill Frisell, Fred Frith, Mark Harris, Erin McKeown, Ron Miles, Tatsuya Nakatani, Pauline Oliveros, Jane Rigler, Elliott Sharp, Matt Wilson among many others. Janet collaboratively conceived of and co-curated the international new media festival MediaLive (2011-17), is currently an artistic associate of Square Product Theatre, and serves the boards of Creative Music Works and Supporters Of Children.